Gamebooks have three particular groups, and they are Branching-Plot novels, Solitaire Adventure and Adventure Gamebooks, which is actually a combination of the previous two and adds in a simple role-play system. Notable Adventure Gamebooks include the Lone Wolf series, which should strike a chord with some Switch owners, as a video game version of Joe Dever’s Lone Wolf, happened to grace the Nintendo Switch earlier this year. Another notable series is Fighting Fantasy, which you’re going to be hearing quite a bit about, over the course of this review. Created by Steve Jackson and Ian Livingstone, Fighting Fantasy is a series of adventure gamebooks that date back to 1982, which is when the first book was published. Their creation was able to establish itself as being different from the rest, thanks to fusing dice-based role-playing with the type of story-telling that comes with Choose Your Own Adventure. 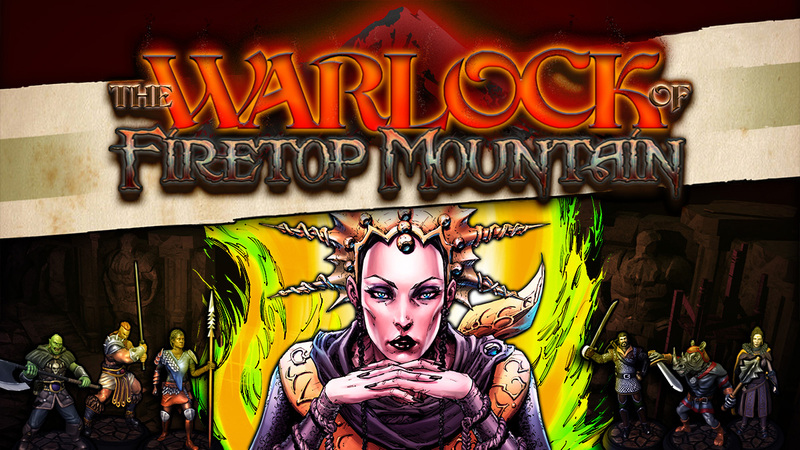 As for the first book in the series, it’s none other than The Warlock of Firetop Mountain. The Warlock of Firetop Mountain would not remain as just a novel though, as Tin Man Games went about creating a video game version of it, which is playable on the likes of Steam, mobile devices and the Nintendo Switch. Only it’s not just The Warlock of Firetop Mountain that has come to Switch, but The Warlock of Firetop Mountain: Goblin Scourge Edition!, which means this release comes with the base game that released and the extra Goblin Scourge content that comes with 3 new Heroes. Being a tabletop RPG that has come to life, it might delight Fighting Fantasy fans to know that the video game, does in fact still play out a lot like the books. It is still very much so story-driven, action-packed and every decision matters. Not every journey through the mountain will go smoothly for you, as the experience can change based on whom you are playing as and their objective, but as long as you’re enjoying the ride, all is well. However, The Warlock of Firetop Mountain, is not a board game for the faint of heart, for it is not without some difficulty to it. Sure, it will give you plenty of choices throughout the game, such as which direction do you wish to proceed in, whether to fight or flee or overstay your welcome, every decision you make matters. What could be the right decision in one playthrough, could be the worst one in your next one, but that’s actually the beauty of a game like The Warlock of Firetop Mountain. With Choose Your Own Adventure games, you are tailor making your own adventure every time you play and unlike roguelikes where you die once and it’s game over, The Warlock of Firetop Mountain actually gives you three lives to do your best. It will also restore you to the last bench you decided to take a rest at, thus allowing you to pick up almost where you left off, instead of starting over afresh, from the beginning. You will however, lose the souls that you gathered after your last rest, so if you destroyed a big bad monster, like the Minotaur, you’ll have to fight him again if you want the pay-out he can offer you. In terms of gameplay, in case it’s not obvious yet, it comes in two parts. The first is exploration and decision making, which is accompanied by a ton of text for you to read through and battles. Much like making decisions, the battles are straight-forward. The player and the monsters they need to beat are represented on a game board and you need to defeat them before they defeat you. If they deplete your entire stamina bar, you will die, so it’s always important to try and maintain 10 or more stamina before charging into combat. As for what happens when you are fighting, everything is turn-based. You can either choose to move, or attack and the enemy will do the same. If they move somewhere where you think they’re going to go and you’re right, your hit will land. If they don’t, you’ll miss. In the event you’re both standing in front of each other and both go for an attack, you’ll then Clash and it then falls to dice, which you must roll, to determine who will win the clash. Only it’s not as simple as that, because if you remember about the stats a player has, one stat is Luck and your Luck points will be factored in for every role you make, except for instances when exploring the mountain’s dungeon and you need to roll less than a 9. During these events, your Luck Points go toward trying to assist you in getting a low role. But be warned, if you an enemy both make a move for the same spot, a shove will occur and enemies can land status effects, such as inflicting poison upon you, so even in battles, every choice you make matters as well. So, if you can avoid a showdown, always try to strive to do just that, as there’s no point losing lives in the first half an hour of your playthrough, when you’ll be wanting them nearer to the end. If however, you feel you must engage in every skirmish you come upon and wish to skip a lot of the game text as well, then perhaps you’re better off playing Gauntlet mode. Not only will this mode allow you to play on the side of darkness, thanks to a few of Warlock Zagor’s being playable, but this mode is more focused on combat and a lot of it, and is rather light on the details. The characters for this mode do require purchasing and do come to us thanks to the Goblin Scourge DLC, as does three additional adventurers, whose stories are heavily tied to the Goblin Scourge DLC. However, if none of the above are reason enough for you to play it, or the 100 mini figurines that feature in The Warlock of Firetop Mountain, there’s always the Extra menu. From a lengthy lesson in the history of The Warlock of Firetop Mountain and the Fighting Fantasy series, there are also achievements to be earned and an art gallery you can fill out by playing through the game. Plus, aside from some minor performance issues, touch-screen controls are supported and they work pretty great for navigating the games’ menus and text. If you are not a fan of Adventure Gamebooks, The Warlock of Firetop Mountain is not a game that will appeal to you. Sure it has great story-telling, but if you’re after an RPG with story, the Switch is stacked with quality titles that fit the bill. However, if Adventure Gamebooks are your jam, you can’t go wrong with The Warlock of Firetop Mountain. It’s stacked with content, it will have plenty of replay for fans of its genre and you’ll be able to get plenty of enjoyment out of it, before moving on to the next game.